The Michelin Defender is a standard all season touring tire that was made for a variety of vehicles including small crossover vehicles, family cars and minivans. 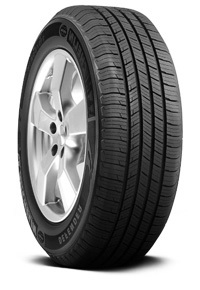 These tires provide a comfortable drive while providing confident steering and traction in all weather. Made for use in dry and wet weather these tires are a great choice for those who live in areas where there are mild winters with no snow. The Michelin DEFENDER replaces the Michelin HARMONY and has all its features plus more. This tire meets Michelin’s Green-X low rolling resistance objectives which mean that the tire will actually improve the fuel efficiency of any car that they are installed on. The tire is an extra-long wear tire that provides comfortable driving to consumers in all seasons. Tread compound is made with a silica based material molded into a mild asymmetric tread pattern. It provides excellent traction across a range of ambient temperatures and in a number of different driving conditions. These tires feature Michelin IntelliSipe Technology which promotes the rigidity of the tread block. This in turn reduces the wear rate of the tread and the rolling resistance which is what improves the fuel efficiency of the car that has these installed.